Notre Dame College appears in our ranking of the Top 20 Best Online Bachelor’s in Early Childhood Education Degree Programs. In Regina Hall, the Division of Professional Education confers a Bachelor of Arts in Education at a 16:1 ratio for Notre Dame College undergrads called to advocate for social justice by giving diverse PK-12 pupils the resources and respect for good citizenship. Chaired by Dr. Sue Corbin, the 120-credit, CAEP-accredited major offers four Ohio licensure tracks: Early Childhood, Middle Childhood, Adolescent/Young Adult, and Multi-Age Special Education. Besides 100 practicum hours, seniors spend fifteen 40-hour weeks at student-teaching placements, such as Denison Elementary, Glenville High, Warrensville Heights Middle, Ginn Academy, and Whitney M. Young School. For bachelor’s grads, the Teacher Education Evening Licensure (TEEL) Program accelerates a second B.A. for high 99 percent Praxis II exam success. On Moodle, NDC also grants the Online Master of Education directed by Dr. Sarah West for advanced classroom capacities. Master teachers add PK-12 endorsements in Mild/Moderate Intervention Specialist, Reading Specialist, or Education Technology Specialist after 33-66 online credits, including research projects. Notre Dame College originated on March 26, 1922, when Mother Mary Cecilia Romen sought approval from Bishop Joseph Schrembs to open a women’s college. That September, the Sisters of Notre Dame welcomed an inaugural all-female class of 13 to its Ansel Road academy for just $75. In 1926, construction began on its permanent 39-acre South Euclid campus donated by the Jordan Family. In 1938, Notre Dame College graduated the first African-American student. Four years later, a WWII Accelerated Program launched to finish bachelor’s majors in three years. Committed to flexibility, NDC further created the Lifelong Learning Center in 1969 for nontraditional women. In August 1991, the first two women entered Notre Dame’s Master of Education program. 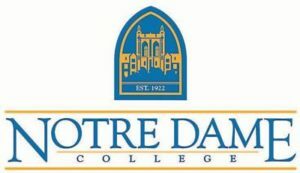 Coeducational since 2001, Notre Dame College opened the Dwyer Learning Center for Students with Learning Differences in 2005. Gifted $1.5 million in 2017, NDC now serves 2,100 Falcons from 10 nations online and on-site with 17 organizations like Math Educators Club. The U.S. News & World Report ranked Notre Dame College among the Midwest’s top 165 institutions with 63 percent retention. On Niche, NDC boasts America’s 303rd most conservative students, 501st best athletics, 638th most diversity, and 662nd top location. College Factual crowned Notre Dame the 178th best Catholic school, 168th most popular special education program, and 174th most focused teaching unit. The New York Times placed Notre Dame College 105th overall for low-income students. PayScale recorded a median mid-career salary of $77,500 for NDC alumni. Forbes named Notre Dame’s Cleveland metro the 167th best for job growth. Washington Monthly declared NDC the country’s 293rd best baccalaureate college with the 100th most volunteer service. Special Education Degrees positioned the Online Master of Education sixth nationally. College Values Online also deemed Notre Dame the 46th most affordable small Catholic choice. On November 13, 2017, Notre Dame College received notice that the Higher Learning Commission of the North Central Association’s (HLC-NCA) Institutional Actions Council Hearing Committee voted to reaffirm the Level III accreditation through 2027 under its 14th president, Mr. Thomas Kruczek. Headquartered 357 miles west via Interstate 80 in Chicago, this mammoth 19-state Upper Midwest accreditor is authorized by the U.S. Education Department to assess student outcomes in NDC’s one associate, 36 bachelor’s, six master’s, and five certificate programs. The Division of Professional Education earned full approval from the Council for Accreditation of Educator Preparation (CAEP) in October 2018. Notre Dame is also a member of the American Association of Colleges for Teacher Education (AACTE). Getting into Notre Dame College is classified “moderately difficult” by Peterson’s because only 652 of the 1,255 Fall 2017 applicants were victorious for selective 52 percent acceptance. Falcons flocking to the Bachelor of Arts in Education must finish pre-major courses first. Most are sophomores or juniors who’ve passed ED 202 and ED 204. Completing at least one 300-level course graded “C” or higher is mandated. Cumulative GPAs above 2.75 are required to avoid an Action Plan. Good English ability with Accuplacer Writing scores in the 50th percentile is expected. Non-native speakers must reach the 500 TOEFL, Grade 2A STEP, 18 ACT, or 860 SAT mark. The TEEL Program admits post-bachelor’s candidates from regionally accredited colleges with 2.75 GPAs or better. Online Master of Education cohorts need higher grade point averages of 3.0. Fifteen prerequisite credits include Educational Psychology, Curriculum Development, and Learning Assessment. Those seeking the K-12 Reading Endorsement must have current Ohio teaching licensure. Notre Dame College has rolling year-round admission for no regular deadlines. However, the priority scholarship deadline is February 15th yearly. Interested Bachelor of Arts in Education majors easily submit the Freshman or Transfer Application online for free. The Office of Graduate & Adult Admissions has separate $30 applications for TEEL or Master of Education entrants. Official registrar records are mailed to 4545 College Road in South Euclid, OH 44121. Standardized test reports are generated with SAT code 1566 or ACT code 3302. Supplemental teacher items include the two recommendation letters, an original writing sample of 1-2 pages, education certifications, professional résumé, citizenship form, and background check. Please inquire further at (216) 373-5173 or admissions@ndc.edu. For 2018-19, Notre Dame College is billing full-time Bachelor of Arts in Education majors $14,730 per term or $29,460 annually. Mandatory student fees are $700 per year. Please note the $100 orientation fee, $100 TK20 subscription fee, and $300 student teaching fee are extra. Living at the South Euclid campus’ dorms like Petersen Hall adds $4,850 to $8,250 yearly. Full meal plans for Normandy Dining Hall are $5,130. NDC budgets $1,400 for textbooks and $3,090 for residential expenses. Annual bachelor’s attendance equals $44,290 on-site and $33,790 at home. Undergrads studying part-time pay $580 per credit. Online Master of Education tuition charges $590 per credit or $21,240 to $38,940 total. According to the NCES College Navigator, the Financial Aid Office in Administration Hall helps 71 percent of NDC Falcons swoop into median assistance of $17,518 yearly for $22.49 million overall. Collegiate funds include the Presidential Honors Scholarship, Dean’s Scholarship for Academic Excellence, Legacy Scholarship, Notre Dame Grant, Leadership Scholarship, STEMM Scholarship, Athletic Scholarship, and Phi Theta Kappa Scholarship. The Jeanne Squire Memorial Scholarship gifts $1,000 to women age 25 or older from Cuyahoga, Lorain, and Medina counties. The Medina County Retired Teachers Association has a May 1st deadline for $1,000 education scholarships. Likewise, the Mary Elizabeth Keller Scholarship has awarded $77,350 since 1992 for PK-12 Lorain County teachers. Submitting FAFSA forms coded 003085 would unlock Federal Pell or FSEOG Grants plus the $4,000 Teach Grant. The College Work-Study Program offers up to 17.5 hours weekly of campus employment. College Factual lists average debt of $27,672 from Perkins, Stafford, and Graduate Plus loans. Ohioans also pursue the College Opportunity Grant, Forever Buckeyes Fund, War Orphans Scholarship, and Choose Appalachian Teaching Scholarship. Find more about Notre Dame College at the Division of Professional Education website.